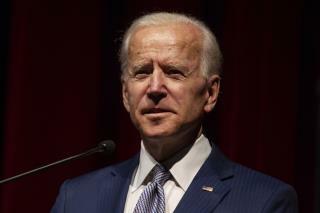 (Newser) – Joe Biden says he knows who should be the next president: himself. But the former VP says he's not ready to commit to a 2020 run. The comments came Monday during a stop in Montana to plug his book Promise Me, Dad, reports CNN. "I'll be as straight with you as I can," Biden told the crowd at the University of Montana in Missoula. "I think I'm the most qualified person in the country to be president." He said two big issues of the day—"the plight of the middle class and our foreign policy"—were his strong suits. "Even my critics would acknowledge, I may not be right but I know a great deal about it." His delusional braggadocio makes me almost vomit. And its so intact. Put him on the island with the Sinalese. Republican Party : Sure, that is just a "Take It or Leave It" choice, if the 2020 US Senator Susan Collins is not the 2020 Republican Party's Presidential Nominee, then naturally the Democratic Party's Joe Biden may get a chance from Americans votes; however, Joe Biden will has a lot of headache from Grandma Nancy Pelosi's national debts and deficits.